I write from my heart. If you don't do that you're up poo poos creek. I was looking at a Manhattan skyline when Geronimo the gnome popped in my head. I didn't start writing it untill a few yrs later after I was married living in Seattle. Took 4 years to write. When I was done I felt like a tired, redemptive Snow White, waiting for her all her animals to show up. 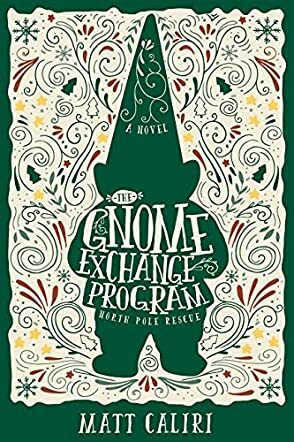 Gnome Exchange Program: North Pole Rescue is an action and adventure fantasy novel for young adults written by Matt Caliri. Geronimo hated tree dining -- especially the constant threat of a barrage of half-eaten food dropping down from the diners sitting in the branches above him. He didn't want to be at the restaurant at all. Yes, it was his twelfth birthday, an auspicious one for a gnome, but his parents had decided to celebrate it by sending him away. He could sense them watching as he glowered, and decided to feign sleep rather than deal with them, but a face full of ice water made that impossible. They were sending him to the North Pole on an exchange program. He would take on an elf’s duties up there, and the elf would get to guard his square of garden in his place, but guarding that square was all Geronimo wanted to do. His parents were adamant, however; he would go to the North Pole. Geronimo had no idea how his parents could send him away like this, and he couldn't begin to think about what it would mean to Eleanor, his young and admittedly wayward human friend. Then he was off to the North Pole. Author Matt Caliri's young adult and preteens coming of age fantasy, Gnome Exchange Program, has for its hero that most unlikely of heroes, a garden gnome, and a young and not terribly exciting one at that, but somehow the author manages to get the reader past the image of that ubiquitous little bit of statuary and into the realm of the fantastic. Lest some fear this may be tame fare, be warned that the most unpleasant and un-Christmassy of characters, Krampus, plays a leading role in this adventure fantasy where a young prince (read garden gnome) must conquer his innermost fears, succeed in his quest, and rescue the damsel in distress. As you read this provocative, well-written and humorous tale, keep in mind Geronimo's actual form to get the full effect of this clever and inventive story. Gnome Exchange Program is most highly recommended.